First thing’s first: While humans may not love spending time in a small space, it’s important to know that crates are not scary or cruel. Dogs naturally seek out small spaces of their own, and crate training is a way to nurture that instinct. By teaching your puppy that their crate is a favorable place—and never using it as a punishment—they’ll quickly learn to think of it as a safe and cozy den. Crates can also help your little guy stay out of trouble and keep them safe in the car when you travel. Read on for a step-by-step rundown of crate training. 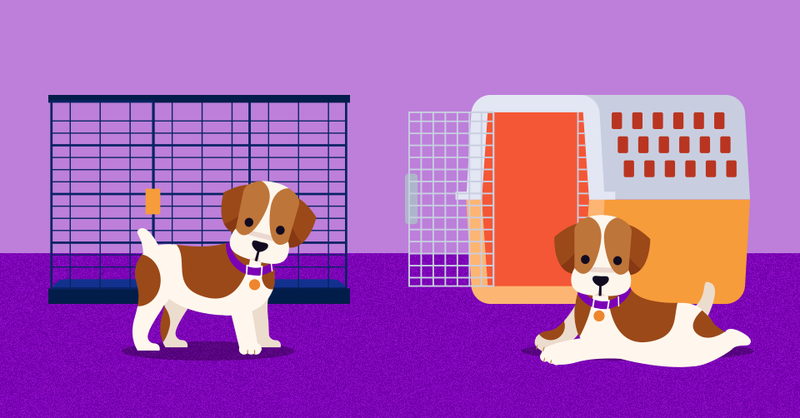 Once you have the right crate, teach your puppy to love their new space with these steps. Set up the crate and leave the door wide open. Allow your puppy to explore the crate at their leisure. Make the inside cozy and inviting with a soft blanket or dog bed. Praise them for any calm, positive interactions with the crate and prop the door open so it does not swing closed while your puppy checks out the interior, which can scare them away and deter future investigation. If they haven’t yet entered the crate, encourage them to do so by tossing a couple of special treats or a beloved toy into the crate. Even if they only dart in to grab the items before dashing back out, praise them for being brave. You can also try feeding them in the crate while you supervise. If they’re not yet comfortable finishing a meal inside the crate, try placing their food near the crate to foster a positive association. When they go into the crate and remain there longer than a moment, offer occasional treats to reward them for staying. Then, cue them to come back out. This way they learn a command for leaving the crate, and you can then work on commanding them to go back in. If you don’t already have a command, simply saying, “Crate!” in a happy voice is quite effective when paired with a treat. Remember, you don’t want it to sound like you’re punishing them—crate time should be an exciting time! Once your puppy becomes more comfortable with the crate, you can start leaving them in with the door closed, beginning with just five minutes at a time. You can leave them with a favorite durable toy, but do not leave food and water in the crate when you’re not there. Create a routine around the crate. Always take your puppy outside before placing them in their crate and use the same command every time to let them know it’s time to go in the crate. Offer a treat or other high-value reward for going in, and when it’s time to let your puppy out, go straight outside for another potty break and perhaps a play session. And praise, praise, praise every step of the way. Only leave your puppy crated for reasonable amounts of time; even if they don’t want to eliminate where they sleep, sometimes they simply can’t hold it. Although every puppy is different, a general guideline to follow is that a puppy should be able to hold it for as many hours as their age in months (so, a 5-month-old puppy should be able to go for around five hours without an accident). Puppies also need playtime and exercise, so even if they’re able to avoid having an accident while the house sleeps through the night, that doesn’t mean they should be left in a crate all day long with no breaks. Crate training your puppy will give you greater comfort when you need to leave for any period of time and will also provide your puppy with a cozy place to curl up in if they’re stressed, tired, or just want to be alone. It’s something many dogs and their owners continue to rely on throughout a dog’s life, so creating a positive connection with the crate early on can continue to benefit you and your dog for years to come. Please include attribution to PupBox.com with this graphic.